On our first night in PA, we ate at The Settlers Inn. A historic bed and breakfast lodge doubling as an award-winning farm-to-table restaurant, it stuck out as a place we had to make it to while we were around. The offerings change seasonally, and much of it is sourced locally. 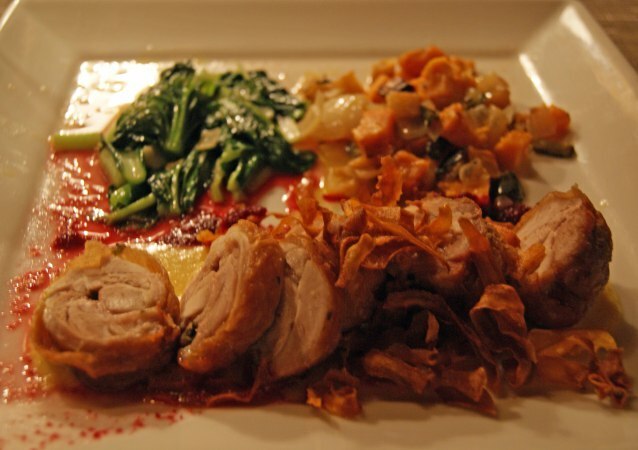 On this night, the menu was quintessentially autumn, boasting pork, a variety of winter squash, apples, sweet potatoes, duck, and warm spiced cider. Sitting in a cozy corner of the restaurant, with some sporadic piano playing in the background (the gentleman had a bad shoulder, so he spent more time walking the room than playing – he visited our table at least three times), a chill in the air, and delicious aromas wafting through the air, we had a rather enjoyable evening. 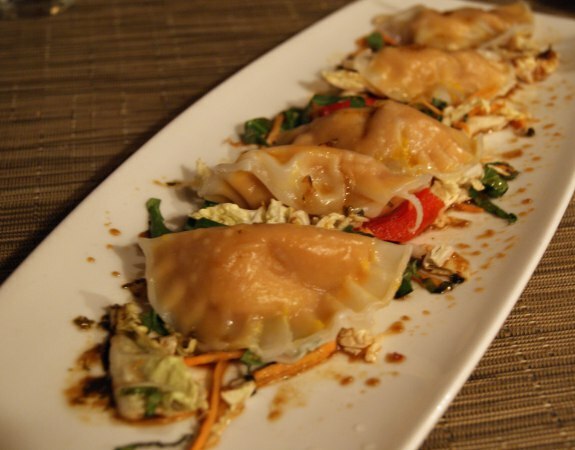 We started with Roasted Hubbard Squash Dumplings, which had a bit of an Asian twist with a ginger-soy sauce and Napa cabbage slaw. Hubbard has a more earthy taste than butternut, for example, so the dumplings had a different flavor profile, but were still excellent. 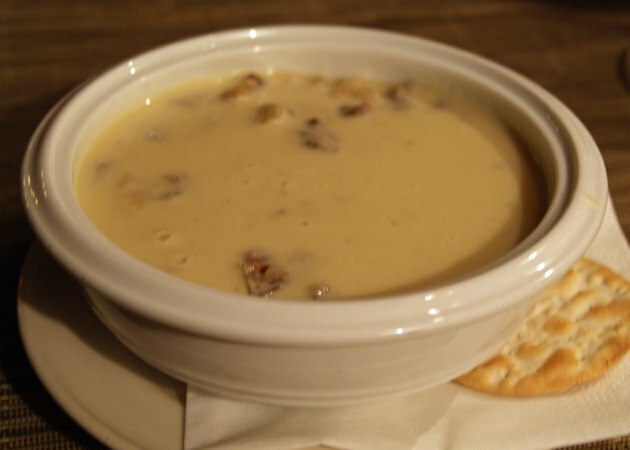 Also ordered was a cream of celeriac soup, which had the nicely mild celery flavor spiked with salty chunks of bacon. Surprisingly, we both ended up ordering chicken for our main course. Different cuts, but we rarely order the same protein when we’re out – the sides just sounded too good to pass up. S tried a Crispy Herb Stuffed Chicken Leg Roulade, which was served with sweet corn sauce, and a sweet potato, apple and poblano hash. 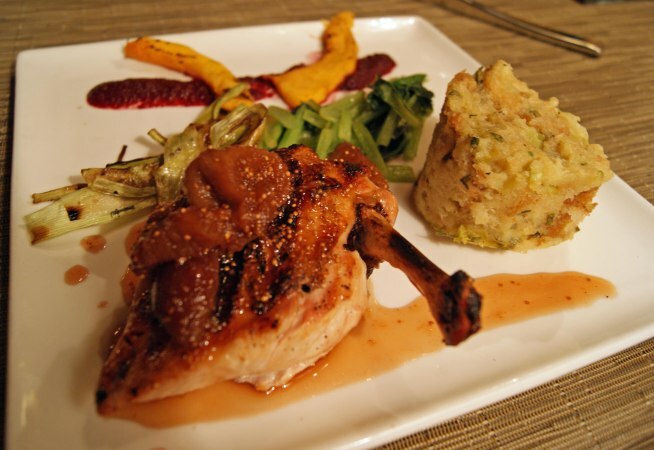 I decided on a grilled bone-in chicken breast, alongside fig compote, leek bread pudding, and pumpkin “bacon.” The fig added a really nice sweetness and the bread pudding was fabulous. Both meals were well-done and quite delicious. 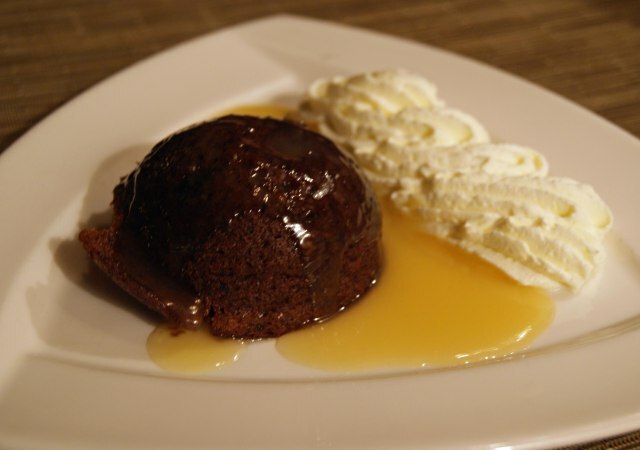 And of course, most importantly, for dessert we opted to try the widely-recommended English toffee pudding, topped with a warm caramel sauce and freshly whipped cream. It was warm and rich and simply delightful. The verdict: Settlers Inn earns about six stars out of seven. The food was all very good; no major complaints. Prices were average for this type of establishment (entrees were $16 – 42), and the service was great. We noted jokingly that S would probably not be referred to as “madam” at Applebee’s – not demeaning college kids working their way through school, it’s just a different level of service. Overall, a nice place to dine, particularly on a chilly fall night. I love the Settler’s Inn. I found it using this new app that reviews restaurants by dish. Check it out!